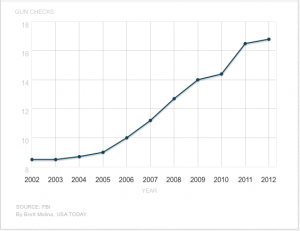 FBI statisics show that background checks for gun purchases have more than doubled in the last decade. During the same period, FBI data also reveals that violent crime has been in a steep decline. While it is not possible to statistically attribute a causation or correlation to the two events, one thing is extremely clear … despite the lies and rhetoric of those who oppose civil rights, more guns in the hands of law-abiding citizens does NOT increase the incidence of violent crime in any way. This entry was posted in Crime Statistics, Gun Sales. Bookmark the permalink.